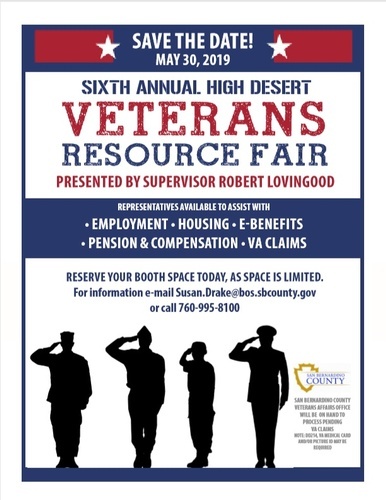 6th Annual High Desert Veterans Resource Fair at the Apple Valley Conference Center. Representatives will be available to assist with Employment, Housing, E-Benefits, Pension & Compensation and VA claims. The San Bernardino County Veterans Affairs office will be on hand to process pending VA claims. Please note that DD214, VA Medical Card and/or picture ID may be required.